Whisk together the flour, sugar, baking powder, salt and nutmeg. Add the buttermilk, eggs, melted butter and vanilla extract to the dry ingredients and mix just until combined. Fold in the 1/3 cup sprinkles. 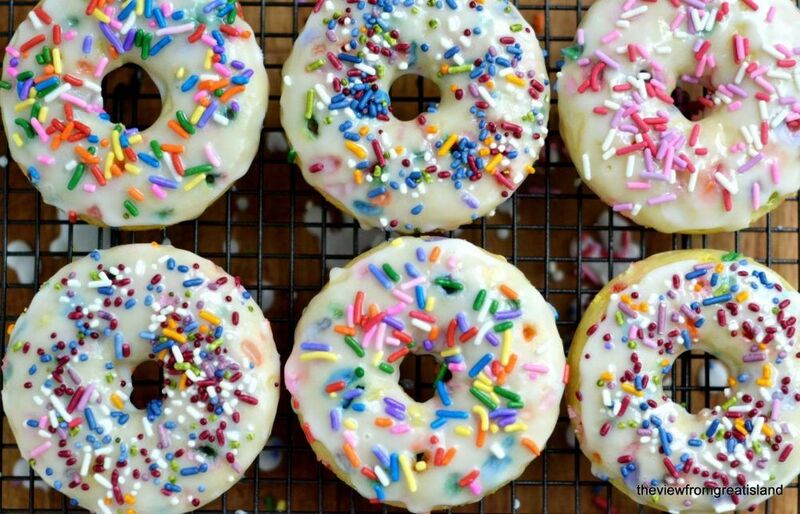 Spray your non-stick full sized doughnut pan and fill the holes about 3/4 of the way full. An easy way to do this is to transfer the batter into a large baggie and cut a small hole in the corner. Pipe the batter into the holes. Bake for about 12-14 minutes until the doughnuts are dry on top and spring back when lightly touched. Let cool for a few minutes before removing from the pan. Make the glaze by mixing the sifted sugar with the milk and vanilla. Add a little more milk if the glaze seems too thick. Add more sugar if it seems too thin. When the doughnuts are completely cool, dip them, top down, into the glaze. Add sprinkles before the glaze sets up.